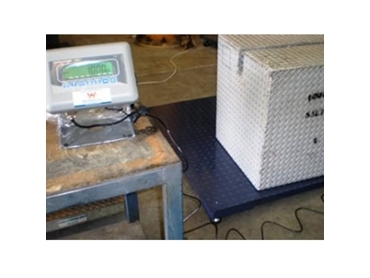 Economy priced Pallet Scales are being used to record weights of scaffolding used in the engineering and construction industries by a world leader in projectmanagement. Supplied by Accuweigh’s Melbourne branch, the A300 Economy Palle tScales assist with precise tracking of outgoing and returning scaffolding deliveries to help minimise equipment losses. Accuweigh’s A300 Economy Pallet Scales feature all steel construction with a painted finish and fitted with 4 x 1t capacity loadcells with 150% overload capacity. Thealloy steel loadcells are fitted with self-aligning levelling legs to allow useon uneven floors and to minimise potential loadcell damage caused by heavyloads being dragged across the weight plate. The large 1,200mm by 1,200mm steel checker-plate weighing surface of the A300 Economy Pallet Scales also makes them ideal for weighing loaded pallets. A high quality Avery E1005 digital weight indicator is used to generate the weight readings while also allowing the Pallet Scales to be used in mobile weighing applications using the in-built rechargeable battery. Standard features of Avery's E1005 multifunction indicator include specialised operating modes to allow the Economy Pallet Scales to be used for Parts Counting, Checkweighing, Totalising and Peak-Hold weighing applications. A RS-232 serial output isfitted to allow communications with external printers, remote displays, dataloggers & PC’s. Accuweighis Australia’s largest industrial weighing company and has eight branchesacross mainland states providing Superior Product Support on all scales and weighing equipment; from laboratory balances to heavy capacity weighbridges.